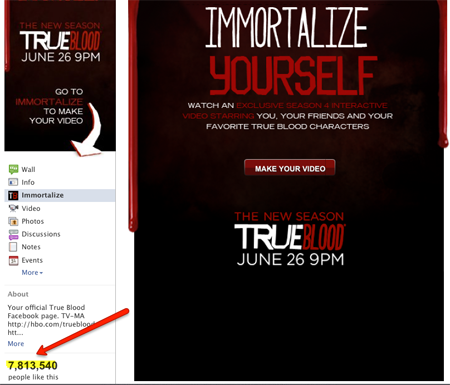 To promote season four of “True Blood”, HBO has launched a Facebook app, “Immortalize Yourself”. It lets you create a video featuring you and your friends, along with the show’s stars – and it’s already approaching 8 million Likes! 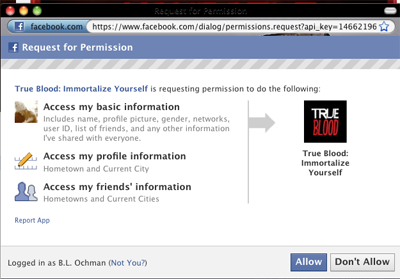 The “Immortalize Yourself” app uses Facebook Connect, which requires access to your friends’ list. I love “True Blood” but I’m not up for giving anyone access to my friends. Below, see what Facebook Connect asks to access. It includes access not only to your Facebook information, but also to your friends’. Apparently, there are at least 8 million people who have absolutely no concern about their privacy, or their friends’ privacy. Am I the only one who finds that scary?